SOLO concert (Time I Know) This evening length concert consists of a captivating array of mesmerizing solos performed by Rebecca Stenn, strung together into a rich tapestry that make up a 40 minute evening length performance. Time I know was commissioned by the Gowanus Loft and was premiered in January 2014. In this work, Stenn collaborated with photographer George Del Barrio for projected imagery, lighting designer Kathy Kaufmann and composer Jay Weissman. Stenn has long been fascinated by the solo form, and has performed numerous solo concerts over the last 20 years. Her work is varied and vivid, and has often been in conversation with a live musician, who shares the stage space with her. Musicians have included composer/bassist Jay Weissman, composer/pianist Konrad Kaczmarek, cellist, Dave Eggar and composer Jaron Lanier. Stenn’s solos have been commissioned by The Joyce Theater Foundation, The Kitchen, Booking Dance at the Edinburgh Festival, The Copenhagen Festival, The Rubin Museum, Soaking WET, and other venues. Signature Works, an evening of classic pieces that have been in the company’s repertoire for 15 years. Pieces include the company signature works The Carmen Suites, Left of Fall, Zimzun, Seventh Wave, and Embrace. The performance includes four dancers and four musicians, performing live. Blue Print is a full evening length performance that was commissioned by and premiered at Danspace, St. Marks Church. The piece runs for an hour with no intermission. This work includes five dancers and three musicians performing live original music and often interacting with the dancers, and has a set designed by Jodi Kaplan. Chopped and Screwed was premiered June 2009 at Joyce SoHo in New York City. The company collaborated with choreographer Ben Munisteri to present an evening of 6 world premieres, all based on choreographers Stenn and Munisteri remixing the other’s work. Fantasy, Lies, Hubris and Voyeurism is an evening length work that premiered at the West End Theater, New York City. The piece runs for 50 minutes with no intermission and includes 4 dancers, one pianist and live video projections that create breath-taking environments by video artist Benton Bainbridge. Time I Know – solo dance performance with projections and sonic score, 35 minutes. Del Barrio, Stenn and Weissman employ multi-media techniques of stop motion photographic projection and combine them with live dance and music. The composed aural environment remixes existing music with environmental sounds, subsonic frequencies and compositions to harmonize with the movements and images. Massively scaled 70ft by 14ft wrap-around images envelop the performers and the space. The walls of the gallery/theater are covered with projections – but unlike other productions where projections are used, this is not a video. The technology takes a fresh and personal approach, utilizing instead thousands and thousands of still images, projected in lightning speed (creating a flip-book effect) to generate movement and a sense of the disjointed flow of time. The existing space comes alive in completely unforeseen new ways. The 1st foray into this inquiry culminated in the full-length solo, Time I Know, premiered January 16-18, 2014 during a critically acclaimed, sold out run at Gowanus Loft. “It is so refreshing to see projection…that actually does something inside a performance; in this case the projection is a major player, an entity in the space, an interactive timepiece. At one point, Stenn’s shadow almost crawls into a projected photo of Stenn’s shadow. The moment is unapologetically beautiful...I’ve missed seeing this caliber of beauty, attention, musicality and compositional eloquence in recent performance.” writes Fran Kirmser Productions Reviews. Oberon’s Grove says, "TIME I KNOW provides a living portrait of a unique dancer...watching her is quite mesmerizing and I wanted the piece to go on and on so that she could continue to cast her spell." Riparius (belonging to the river) is the 2nd full-length work of the projected triptych, part of a larger collaboration between choreographer/dancer Rebecca Stenn and photographer George del Barrio, dancers Eric Bradley, John Mario Sevilla and Raven White, and composer/musician Jay Weissman. Riparius (belonging to the river) explores ideas of architecture – projected images as environments for the dance; structures are built, dancers inhabit them and as quickly as they appear, they transform. The work premiered June 11-20, 2015 for a sold out run at Gowanus Loft in Brooklyn, to critical acclaim: “Memorable choreography…best are stop-motion images of the dancers, which have a ghostly effect, as if the walls were movie screens for spotty memories of the dance… shifting, sculptural…strong” The New York Times. 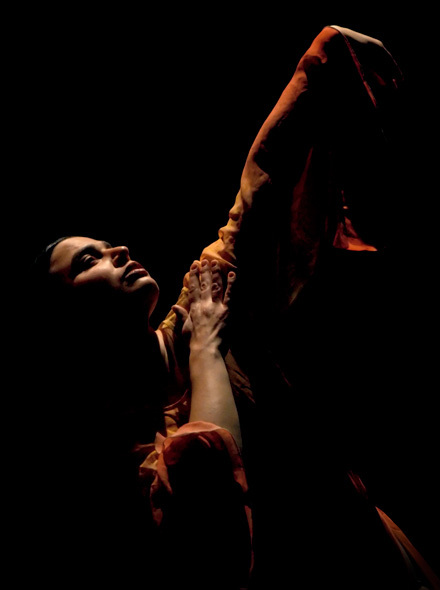 Rebecca Stenn is currently a Lecturer in Dance at the Lewis Center for the Arts at Princeton University, Choreographer in Residence at Dartmouth College and Assistant Professor in the Dance Program at Eugene Lang College, The New School for Liberal Arts.